Bo’ness United manager Allan McGonigal reckons the club’s ‘old guard’ will be out to get them in this Saturday’s Fife and Lothian Cup semi-final at Newtown Park. 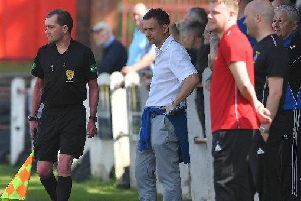 Opponents Broxburn Athletic have no fewer than five former BUs in their ranks and they beat Bo’ness in the teams’ last meeting in the league on March 4. “It is a difficult task on Saturday,” McGonigal said. “The former Bo’ness players will have a point to prove, as they did last time when they beat us. Given Bo’ness’s major injury problems this season, it is a bonus that only defender Will Snowdon (suspension) is missing for the last four clash. “Everybody else is fit and raring to go,” Allan added. The date and venue of the final are still to be decided, but if Bo’ness can take their place there it will give them the opportunity to salvage some silverware from a season which Allan has largely regarded as being “a nightmare”.